Municipalities around the world are responsible for maintaining a clean and sanitary environment which is suitable for humans to live and work. A part of this responsibility is providing an effective system to remove both waste water and storm water and transport both to locations where they can be treated and responsibly disposed. A waste water collection system is usually a network of pipes, manholes, clean-outs, traps, siphons, lift stations and other necessary structures to collect waste water from a location and transport it safely to a treatment facility or disposal system. 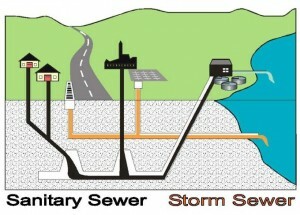 Some systems are “combined systems” which are designed to collect both sanitary waste water and excess storm or runoff water. Stoppages are caused by obstructions in pipes caused by roots, grease, debris, broken pipe or a joint failure. Partial or complete interruption of flow may result from an obstruction. When a stoppage occurs, water and solid material will build up and eventually overflow the system. Streets, homes, and businesses can be damaged and fresh water resources may become contaminated. A community’s health and safety is threatened with unsanitary conditions and the spread of germs and disease. The best method to keeping sewer and storm drain systems working properly is regular maintenance, cleaning, and inspection. The main objective of a Cleaning and Maintenance Program is to operate and maintain the waste water collection system so it will function as reliably as possible.